Recovering from the con but prepping this before hand. Heh heh heh. Michael Shanks!!!! Saving Hope - new series from NBC. Woot! Cool new Prometheus poster from Total Film. More Prometheus extra content. It's almost here! Arrow Teaser Trailer - new TV series for the CW. Not starring Justin Hartley :( Though Stephen Amell looks like he can pull it off. Also has Paul Blackthrone (Dresden!). 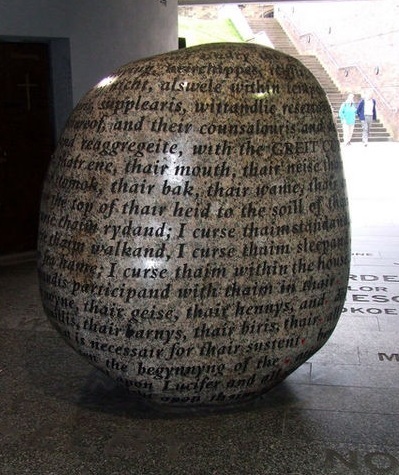 Medieval Mondays: Cursing Stones from A J Walker. An Imperial Walker walker from 22 Words. Beauty and the Beast trailer another CW Fall additions. Designing From Bones - Royal Mountains Majesty from Gene Lempp. From Jami Gold - What Are You Looking For In An Agent? Good food for thought here! Author Platform? But I'm Just Starting To Submit from Darcy Pattison. From Chuck (NSFW) Wendig - Revisiting The Fevered Egos Of Self-Publishing. Literary Devices: Foreshadowing from Amy Rose Davis. From Marcy Kennedy - How To Use Taste To Make Your Readers Hungry For More. The Four Types Of Dramatic Tension from The Writers Alley.